“That child just ate two eggs and a half cup of cottage cheese and didn’t even know it,” I said to my daughter with great satisfaction. She followed me into the kitchen to inspect my victory. The two young boys in this household find most things in life more interesting than food (unless it’s ice cream). Neither boy eats large amounts at a time so it’s essential to pack every bite with good nutrition. You surely know what a challenge this can be on a day-to-day basis. One challenge that comes every day is breakfast. How do you get enough substance into these boys and not too much sugar? Alastair will eat a few bites of scramble from his mother’s plate, but Frederick is convinced that the only good egg is one that ends up in a custard. It is such a sad state of affairs considering that we have two dozen hens happily laying eggs in their little house in the orchard! It is strange that I had not thought of cottage cheese pancakes for the munchkins. My daughters Kim and Amanda ate plenty of them when they were the ages of these two boys. That memory came wafting past my mind and I wondered how the old recipe would work with a gluten-free flour mix. I went Googly and found Ann Fulton of Fountain Avenue Kitchen (here). She vouched for using gluten-free flour in the old standby recipe. 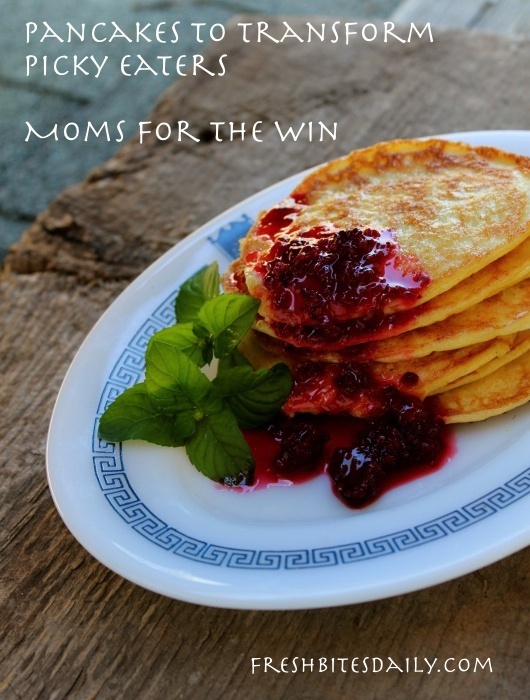 As a result, we started this morning with cottage cheese pancakes. As I was cooking the second pan full I could hear Alastair saying “Yummm” to himself as he ate. The second batch was coming from the skillet as Alastair arrived for a refill. Frederick had two helpings too but was too busy eating to make any sounds. The nicely cleaned plate he brought to the sink after breakfast told the whole story. No one mentioned eggs, certainly not me! 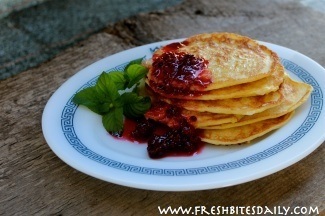 For a topping on these pancakes you cannot beat a bright homemade jam. Alastair wanted maple syrup on his. What? It seemed out of place. When my two were young I couldn’t afford real maple syrup and would not tolerate an imitation, so fruit jam it was! (And still is, as far as I am concerned.) Try them both and I believe you will side with me. We had a bit of blackberry jam in the refrigerator. You know, that bit that was too little to fit into a canning jar at the end of a jamming session. Because it was at the bottom of the jam pot and heated longer than most of the batch, this portion was pretty stiff, even as a jam. No problem! Just add a little water and turn it into pancake syrup, beautiful, purple goodness. Awwww, yes! If breakfast is not your thing, try these pancakes for lunch or dinner. Back in the day, I served these gems at every conceivable waking hour, always to a highly interested constituency. Break the eggs into a medium sized mixing bowl and whisk them until they are light. Puree the cottage cheese in a small food processor or blender until it is smooth. Stir the pureed cottage cheese into the eggs until the mixture is evenly blended. Stir in the vanilla if you are opting for it. Mix the flour, baking soda, and salt together and then add to the egg and cheese mixture. Heat a griddle or large skillet. Coat it with coconut oil and ladle out your pancakes. They need to be small — 1/4 cup portions or less. If you try to make them larger, the pancakes tend to break when you flip them. Cook the pancakes until the bottoms begin to brown. Flip the pancakes and brown on the other side. Drizzle the pancakes with melted butter and a topping of your choice: syrup, jam, or fresh fruit. Leftover pancakes can be refrigerated in an airtight container and then warmed in butter for a second meal. You may even want to plan for these leftovers. Wouldn’t they make a super after-school snack? Enjoy!